A problem with this experiment is the extremely small displacements that indicate a thrust. A displacement of 4 micrometers has the TP beam move through just 1.7 arcSec. of rotation. If a laser beam was reflected off the LDS moving mirror and someone was 1 km away they would see the reflected dot move just a few mm. The LDS is just as sensitive to angular changes of the mirror. An experiment of this type requires repeatable, consistent results with a signal level far above what is currently seen to provide proof of this proposed theory of its operation. Is that displacement assuming we will get EW's thrust values? If we use a microwave oven magnetron putting out 1 kW I hope we get much higher thrust values than EW who used only 17 ~ 50 W.
Mmm, yes, for having "probed" that specific aspect of the pendulum system used at EagleWorks, their design is quite stiff : produces small deviation wrt forces. The forces are small and this relatively high stiffness (due to flexure bearings as pivots) doesn't help. Rambling again : the exact apparent stiffness (in µN/µm at end of arm) at EW is a poorly characterised aspect of the experiments, taking the calibration pulses as a reliable starting point gives between 9µN/µm to 40µN/µm across the various released charts, and all are in contradiction with both flexure bearings ratings and harmonic oscillation period (when visible, on underdamped plots). Appears the measures on the vertical scale of plots show much higher stiffness than it should be (too low displacement readings ?). Anyway, there is no reason not to go with a much lower stiffness system, or no stiffness at all (no position restoring force) and record mm or cm displacements (linear or angular) as thrust accelerates the mass (as in Shawyer). Email received from Roger Shawyer in regard to a question to verify if Dr. Rodal's Df excel equation is correct. Shawyer also cautions, very strongly, on the dangers of working with high power microwave systems. I obtained the following expression for the frequency at which my interpretation of Shawyer's Design Factor blows up. Thanks. Appreciated. Will add yours to the Shawyer equations my old brain is working through. Making progress but what happened to the skills I had during my Uni days? Too many engineering calculators now days. But then they do reduce human calculator / slide rule errors and hence risk. Question? What if cavity length is not the biggest cavity dimension? Should not the biggest cavity dimension be used, as I have read in the microwave waveguide theory stuff I'm researching? Roughly correct (the diameter and the length have different factors), would you like me to give you an equation for the Design Factor in that case? Would also like to understand the different factors & how they are derived. What measured force at NASA Eagleworks would be high enough to give confidence in the force, in your opinion? Or there would still be a problem in your opinion with higher measured forces and higher measured displacements, as long as the stiffness remains in that range? For example would a measured force of 200 µN and a measured displacement of 20 µm giving 10 µN/µm stiffness still lack confidence in your opinion ? And weren't there earlier murmurings that a domed end-plate should be used on the large end of the frustum instead of a flat-plate? Wouldn't you need to measure length to the center of the dome, and not the edge? From what I can see, Shawyer assumes the end plates are spherical and the length between them, measured relative to a line from the vertex of the cone are the same at all points. Which means cavities with flat end plates will not achieve the calculated Df nor have a narrow resonant frequency band not have in phase end plate reflections. Is why if you desire to have a high Q cavity, curved end plates are required. Which is what will happen with my Flight Thruster replication, which will have a variable frequency Rf generator to hunt for and find the best operational frequency. I don't dispute the need for a low thrust torsion pendulum. I'm just stating that a reflected laser beam can't provide the required resolution. The measurement sensor EW used could measure small displacements with more precision than a reflected laser beam. Microwave Oven magnetrons are hazardous and potentially lethal devices when removed from an oven. For FCC compliance and safety reasons it should be enclosed by a 6-side Faraday cage with a power interlock. Even that may not be enough to satisfy the FCC if interference is reported. I agree the reflected laser beam cannot provide the resolution required using low power (~50W) which is why we will be using high power (.5 ~1 kW). I fully understand the risks of working with high power sources and will be taking the necessary safety precautions. I have thought about using a cavendish pendulum but the diameter of the vacuum chamber is only 18.5 inches, so it will be a bit more difficult. Our current apparatus will (probably) be able to be transformed into a small cavendish if necessary, but I anticipate we will get thrust values close to Shawyer or NWPU because we are using magnetron, thus we might not need one. The dimensions for resonance near 2.45 GHz have been posted on Mulletron's drive along with his VNA plots. We plan to use his dimensions and incorporate a constant cross section cylinder (~3 inches tall) connected to the larger end of the frustum with a movable plate inside. This will allow us to adjust the effective height of the cavity until our VNA tells us we have the dimensions necessary for resonance. We also plan to use an intermedate symmetric resonant cavity to convert the magnetron signal to a coaxial cable so that we can sample the signal input to the frustum to determine frequency and power. This will allow the magnetron to stay outside the vacuum chamber so that it can be air cooled as well as reduces the weight of our pendulum. One thing I am worried about using the intermediate cavity is we are reducing the amount of noise in our signal and isolating the frequency. It seems that the phase modulation has led to an increased efficiency, so I have been considering splitting the coax signal to two different ports on the frustum for equal power signals at different phases. However this is a recent idea I have yet to research and would only be something we try after the simple setup. I guess that anecdotally lends credence to my previously-stated suspicion (from God-knows how many months back ) that the bottom ring on this thruster is a painted rubber gasket that acts as a footer for the domed bottom-plate it is protecting (even though the visible top plate is flat). The cracked paint on it is a dead-giveaway that it's a spongy material like rubber or silicon- perfect for a footer. The Flight Thruster has a quoted Q of between 50,000 and 60,000. IMO, to achieve that, both end plates must be spherical, which helps to explain the external thick end caps, which may also enclose pressure seals. As an added bonus, sticking with the dimensions provided by Eagleworks allows folks to use their COMSOL plots. While this cavity design might not be the optimal shape/size for max thrust, Paul March has provided potential replicators with an arsenal of very useful data on this thread applicable to those particular dimensions. I haven't caught up with the math yet, but if I can help out with any coding I'd be more than happy to. Feel free to email ([email protected]). Great! Good luck with your tests and take care! As I understand it, your cavity is same as that one? Correct? Did you find the same 2,445GHz cavity resonance as Paul did? If not what resonance frequency did you find? Got different freqs. One is close. Found another at lower freq. Cavity dimensions are same to within about 1mm. See results here: https://goo.gl/YJN8y9 See VSWR plots. You'll never get exactly what Eagleworks measured due to minor differences. Even torque on the rf connector makes a slight difference. I'm using a different probe too. You could modify the cavity so that it's resonant frequency can be adjusted. I don't know how easy it would be for you to do this but you could add an interior plate on the small end that can be moved. A couple of copper tubes soldered to the outside of the small end would act as guides for plastic rods connected to the interior plate. Then just move the plate a little bit at a time between tests. Eventually you will reach a resonance point. BTW how hot does the cavity get? It doesn't seem like the magnetron is overheating at all. Maybe it is operating at a low power. It seems that the phase modulation has led to an increased efficiency, so I have been considering splitting the coax signal to two different ports on the frustum for equal power signals at different phases. However this is a recent idea I have yet to research and would only be something we try after the simple setup. Yes, great idea! Do you think it's a good idea to see if you can also provide phase shifting on the second injected signal? I'm still working out this but the preliminary scan into the papers forwarded by Rodal it looks very good but other verification is needed as my math is rusty and my eraser is getting worn. Nice info on Guide Wavelength, which is something Shawyer mentions and uses in many of his equation but never gives the Guide Wavelength equation, which is as attached. 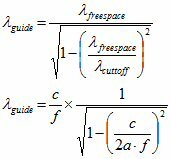 Knowing the cutoff frequency for both ends, can now calc Lambda g1 (big end) and Lambda g2 (small end), then feed that into all his other equations. BTW found this circular waveguide cutoff frequency equation at another useful site. Will be interesting to see how this all hangs together as I put together my version of the Df equation and see how it works compared to Dr. Rodal's. 1) Calc the cutoff frequency for both ends based on their circumference. 2) Using the cutoff frequency for each end, calc the waveguide wavelength at each end using the upper equation of the two. Then you have Lambda g1 (big end) and Lambda g2 (small end) that you can use to calc Df and other variables. I will attempt to construct a spreadsheet that calcs all the variables in the Shawyer Theory pages. Will be interesting to see how it all hangs together. The moving internal plate is probably what Shawyer did in his EM Drive Demonstrator with the long cylindrical back end.